One of the reasons that I love speaking at conferences is the simple fact that I get to hear great ideas too. Even from those that I have heard time and time again. When fitness expert, Alwyn Cosgrove spoke about high intensity interval training (HIIT) this weekend, it wasn’t the first time I heard him speak about HIIT workouts. I’ve heard it several times. 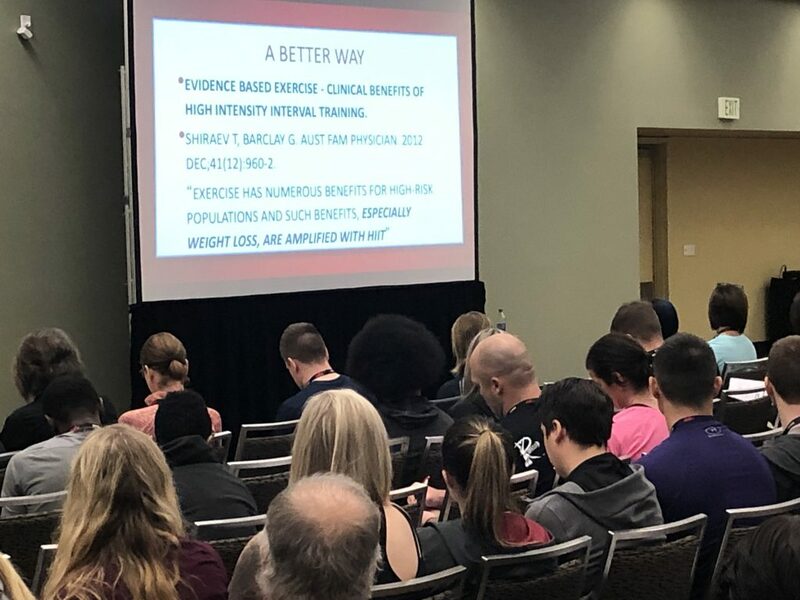 However, what was awesome was the continual research that helps justify what HIIT workouts can deliver more than people realize. I say this because several posts back I wrote about several mistakes people make in creating actually effective HIIT workouts (you can read HERE). However, I still see both a backlash against HIIT workouts and a severe misunderstanding. So, I wanted to tackle BOTH in this post! Truth: To be honest, I am not sure where this one came from. Maybe it is the idea of specificity. Maybe it is the idea that people want to do aerobic exercise and try to find justification so they don’t feel like they are wasting their time? In either case, the research doesn’t support this idea! A 2014 study (HERE) looked at the differences between HIIT workouts and moderate intensity continuous training to see the cardio respiratory effects. What did they find? Oh, did I mention that this study was done on those that HAD chronic disease? So, not only did HIIT workouts work, they worked TWICE as much as those that did the more classic “cardio” based workouts NOT for looking fat loss, but cardiovascular health. Fitness Lying Down inspires us because they show REAL people improving the quality of their lives by living these principles. Myth 2: Beginners Shouldn’t Do HIIT Workouts Because It Isn’t Good For Them. Truth: The other day I saw a post by legendary strength coach, Mike Boyle, where he responded to a coach saying, “because you want it to be true, doesn’t mean it is.” Man, I loved that! Trust me, I get it, it would stand to reason that if you were just starting you might worry about is it safe and healthy for people to participate in HIIT workouts. However, I think the study mentioned above helps debunk a lot of that. Is that a single study though? Not really and this applies to the concern of the safety of HIIT workouts with beginners. Researchers looked at non-weight bearing HIIT workouts in people 65 and older versus moderate continuous long duration exercise. Why non-weight bearing? Because in this age group researchers were looking at those that may have a history of injury and balance issues that couldn’t perform traditional movements. So, would that even work? Not only did the HIIT workouts work, but worked better in improving health markers AND improved aerobic fitness where moderate intensity did NOT! That means HIIT workouts for beginners just have to be smart about exercise selection and programming! Seeing the different ages and ability levels at Fitness Lying Down being able to train to be strong is inspiring and lets us know what is possible! Myth 3: HIIT Workouts Are All About Jumping And Fast Movements. Truth: I think this is where some or a lot of the fear of using HIIT workouts with beginners or older people stems from in the industry. People think that HIIT workouts are just constant jumps, burpees, you know, training like that! The reality is that HIIT workouts don’t always have to be fast, or better yet, should NOT be always fast! A 2000 study (HERE) found that when lifters emphasized the eccentric (lowering) phase of an exercise that it increased resting metabolic rate for 48 hours AFTER training! That means that moving slowly with load and tension can be a powerful way to really increase heart rate. Anyone that has done some of our exercises like lateral drags or slowing down the eccentric phase of a front loaded squat knows how much they stink! However, the benefit is a great increase in metabolic response. So, the hard work is worth it and in fact, is needed. This type of information helps us see that you don’t have to be running, jumping, and doing crazy exercises to get the health and fat loss benefits of HIIT! Dispelling these myths helps us see that there is great potential for HIIT workouts. The important part is being smart in how we use the RIGHT exercises and program HIIT correctly. Check out how Robin Paget shows how we can use DVRT to bring about the BEST of HIIT workouts!